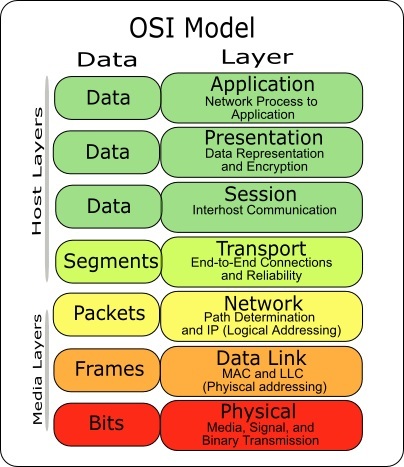 OSI Model is an acronym of organization named International Organization for Standardization which sets basis of communication protocols in computer networks. The reason we mention OSI Model in various articles, is due to the reason, the topics fall inside one of the seven models of OSI Model. A computer network connected to various host is not as trivial as it might seems at first glance. Because of the multitude of issues and problems that needed to be split into different levels or layers. In the OSI model, there are seven layers to meet specified requirements. On each individual layer of OSI Model. Each instance of OSI Model provides services that can use an instance directly. To provide the service itself uses an instance of the services of the next lower instance. The actual data flow is therefore vertical in OSI Model. The Seven Layers of OSI Model are typically described from top to bottom. The application layer is the highest of the seven hierarchical layers. It gives applications to access to the network, for example e-mail , virtual terminal , remote login , etc.. The presentation layer is the system dependent representation of data (such as ASCII , EBCDIC ) in order to form an independent, enabling the syntactically correct data exchange between different systems. Layer 5 provides the way for communication process between the two systems. The transport layer provides the application oriented layers 5 to 7 an uniform access, so that these properties of the communication network does not need to be considered. The main tasks of the network layer include, providing network-wide addresses, routing, creation and updating of routing tables, fragmentation of data packets etc. This layer is to ensure error free transmission and to control the access to the transmission medium. The physical layer is the lowest layer. This layer provides mechanical, electrical and other functional tools available to activate or deactivate physical connections and to maintain and transmit data. Cite this article as: Abhishek Ghosh, "OSI Model : An Abstract on OSI Model," in The Customize Windows, July 11, 2012, April 19, 2019, https://thecustomizewindows.com/2012/07/osi-model-an-abstract-on-osi-model/.